For he knew it was useless to fly3. While he rattled a couple of bones8. "Leave him here to his fate  it is getting so late!" Neither the snark nor the bandersnatch are ever clearly described, though the creature in the Jabberwocky illustration seems more likely to be a bandersnatch than not. In that poem the bandersnatch is described as "frumious" which Carroll's introduction to this poem tells us means a balanced combination of fuming and furious. So the creature is apparently inclined to violent anger and emitting strong smelling vapours. Remarkably, english originally had an adverb ná with a comparative neah, meaning near and nearer respectively. Their pronunciation shifted until they became nigh and near, with nigh falling into obsolescence not long after its appearance in this poem. Like many fossilized english words, it rarely appears outside of formulae like the cliché declarations that "the x is nigh!" insert whichever apocalyptic scenario you like for x. It is clear enough that the verb "to fly" is used here for the sake of the rhyme, yet there are other circumstances where it may be used instead of the form we might expect, "flee." "Fly" and "flee" are separate though related verbs, the one meaning what we would expect, to move swiftly through the air. The connection between them connotation-wise is metaphorical: a person may flee so fast their feet hardly seem to touch the ground, and so they seem to fly. Since people can't literally fly, a not uncommon way of saying "it's hopeless to run but go ahead and try" was to shout "take to your heels, fly!" It's evidently pretty archaic though, something rather shakespeare-tinted. "7 pounds 10" being 7 pounds and 10 shillings in pre-decimal english currency. For Carroll's time, this was a non-trivial amount of money, and times coming to approximately a third or more of a lower middle class annual salary. Here alas, we have what turns out to be a lapse into a patch of inexcusable racism. Looking closely at the Banker's face in the picture, his mouth is noticeably assymmetrical, suggestive of a stroke or in the victorian era term "apoplexy." A person was considered to have suffered apoplexy when, in a state of great rage or other extreme excitement which would deeply flush the face, they suffered a cerebral haemorrhage. A common symptom of the acute phase of a stroke is slurred or garbled speech. At one time being called black in the face meant little more than being so dangerously flushed, and it referred obliquely to the deep purple-black of congealed blood. We can't take the depiction of the Banker to be purely about that meaning of the phrase though, because we have only to glance between the pigmentation of his hands and face, then between those and the skin tone indicated for the Bellman and the Butcher. 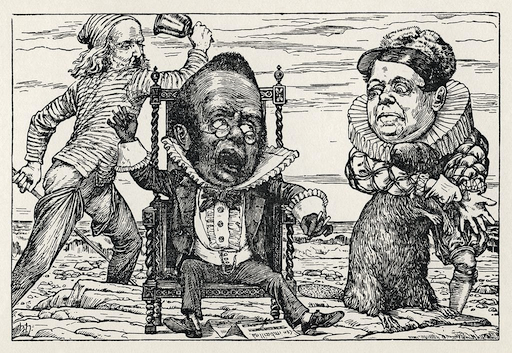 At this point, Lewis Carroll has definitely lost the thread of his better quality and better considered surrealism, and the poem never really recovers. Victorian men's evening dress was, as faithful watcher's of David Suchet's outings as Hercule Poirot will know, the tuxedo, characterized by white shirt and vest with black jacket, pants, and shoes. Courtesy of Humpty Dumpty, we know that mimsy means "flimsy and miserable." A bit of an odd adjective to apply to a sound as opposed to a substance expected to support something like paper or wood, though this juxtaposition points back to the taste of the snark, which is "meagre and hollow, but crisp." Part two of how and why the Banker's fate and how he is illustrated is racist and deeply unfortunate. The bones the Banker is rattling are a type of simple percussion instrument, played similarly to a pair of spoons. According to Goetz Kluge at flickr, the bone playing aspect and the way it is illustrated derives from The Bone Player, an 1856 painting by William Sidney Mount. The painting seems to have some problematic context in its own right, but to be fair my information on it is minimal.